Handles heavy loads while also acting as a dual channel cable protector. Non-skid surface resists weather and chemical damage. 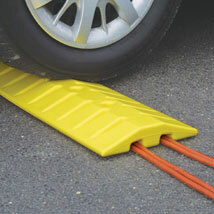 Speed Bumps easily install on concreate or asphalt with included anchor kit.